There are three kinds of people in the world: People who think everything can be broken down meaningfully into threes, and people who don’t. Plus some third kind of person, to make a total of three, which is my point. Please clap. 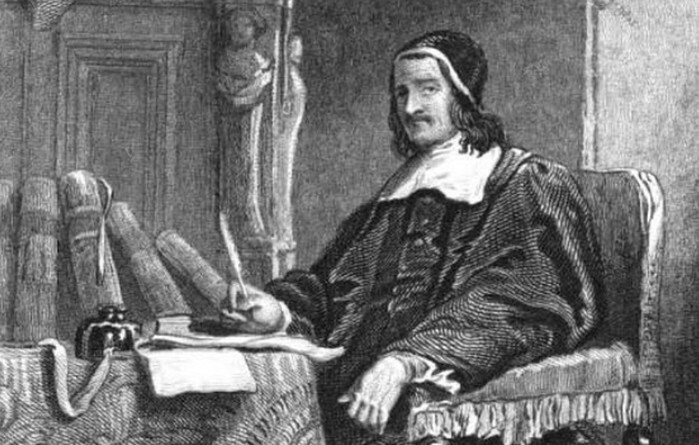 Which brings us to the truly brilliant Richard Baxter (1615-1691), who definitely thought everything important could be broken down into threes. In 1681 he published a treatise on theological method that demonstrated his threefold conviction in a threefold way threefoldly. This treatise, which nobody reads,¹ was Methodus Theologiae Christianae. Already on the title page you can see that he’s got the whole thing bracketed into threes, with sub-bracketings and sub-sub-bracketings. It’s kind of cool just to look at. Now I’m not digging into the actual content here, which would be absolutely the main thing to do. We’re leaving it in Latin and just making an observation about the form. The form is consistently triadic. Ingeniously, inventively, inevitably triadic. Relentlessly, remorselessly, resomethingly triadic. 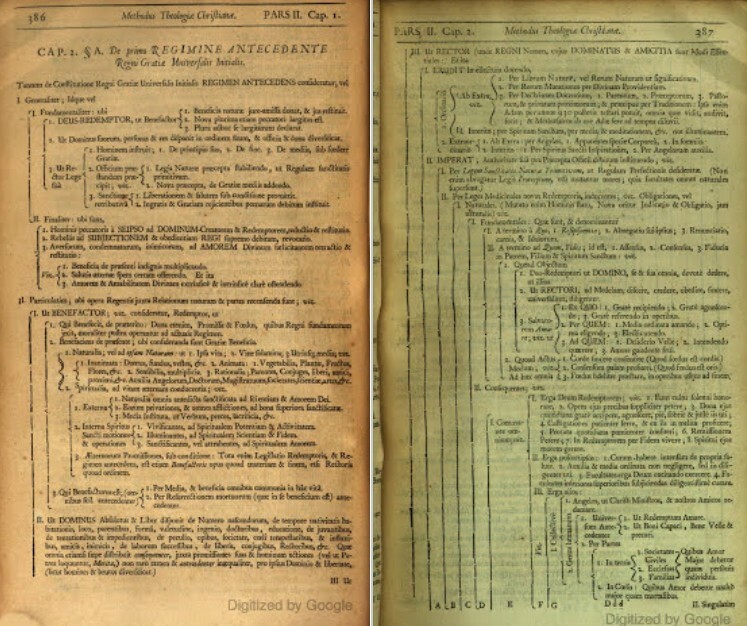 The method which Baxter adopted for systematizing the doctrines of theology may be called Triadism, or what he himself calls “Trichotomizing.” The meaning is, that as all the works and dispensations of God are the productions of Father, Son, and Holy Spirit, some vestigia Trinitatis, some evidences of triplicity, or some marks of triadism, may be expected to discover themselves in all the phenomena of the divine operations. Those who understand what Monadism was to Plato and Leibnitz, and what Tetractysm was to the Pythagoreans, will be prepared to comprehend what triadism was to Baxter. It is his starting point, the principle from which he sets out, the where-to-stand of Archimedes, or, what the German philosophers call his stand-punkt, his stand-point. 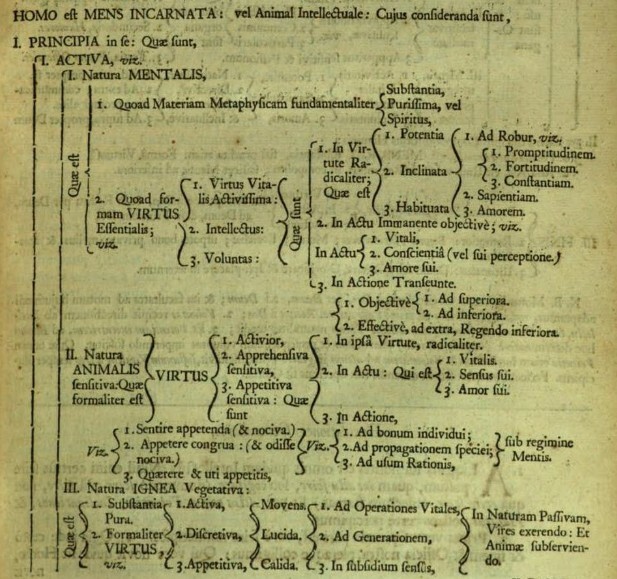 The whole of his Latin Body of Divinity called “METHODUS THEOLOGIAE” is arranged according to this method. 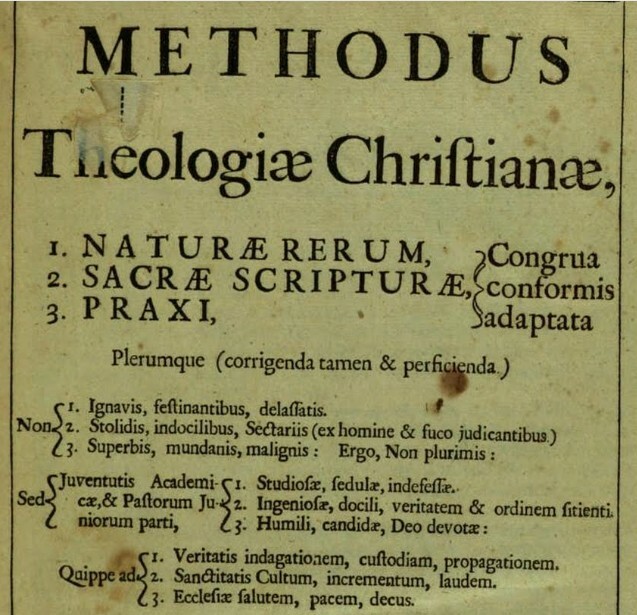 At the close of his “Counsels to Young Men,” published in 1682, he gives the following account of his method of arrangement in the “Methodus.” “It consists of seventy-three tables, or methodical schemes, pretending to a juster methodizing of Christian verities according to the matter and Scripture, than is yet extant; furnishing men with necessary distinctions on every subject; shewing that trinity in unity is imprinted on the whole creation, and [that] trichotomizing is the just distribution in naturals and morals.” This trinal method was a decided favourite, it was almost a passion with him. He saw triadism every where. As in the Godhead he saw Father, Son, and Holy Spirit, so he perceived that in God’s relations to the world, he was Creator, Ruler, and Benefactor,—in the soul of man he saw power, will, and intellect,—in the divine dispensations towards man, he saw nature, grace, and glory,—in salvation he saw the Father as Rector or Ruler, the Son as Redeemer, the Holy Spirit as Sanctifier,-—and in the Grace of the Spirit he saw faith, hope, and charity. To those who delight to watch some great mind at some important work, the practical application of this method to philosophy and theology, must be as interesting as to see a painter plying his pencil and colours, or the sculptor his hammer and chisel. 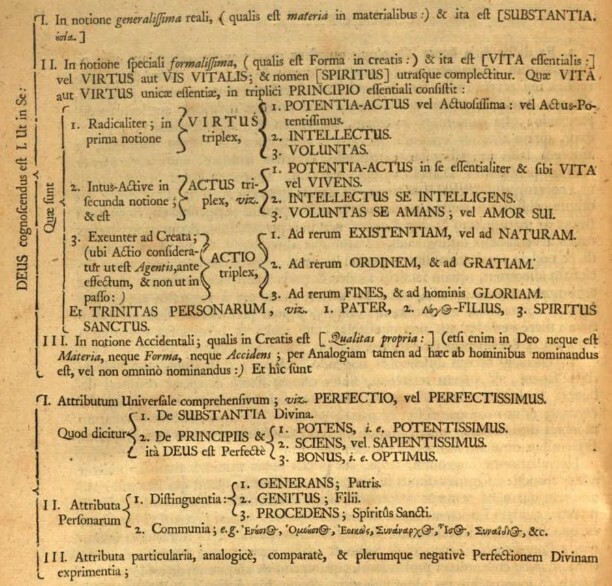 The perspicacity necessary for detecting the trinal “primalities” as they develop themselves in the phenomena of the universe, the skill to analyse them and place them in proper arrangement, and the extent of knowledge requisite to combine all these triads in one complete whole and one grand unity, demand an intellect that is quick, adroit, and comprehensive. The great drawback from the glory of the whole process is, that the effort is not so useful as it is clever and amusing. As an intellectual exercise on the plains of speculation, it is pleasing not only because it is playful, but because also it is a wholesome discipline in the gymnastics of mind. But, as a system of methodizing, it is so hypothetical, so conjectural, and sometimes so phantastic. But it is of no use either to practical religion or to theological science. That is exactly right, both on the positive and the negative side: Baxter is brilliant, and some of his trichotomies are weighty, and all of them are clever. Watching him put this method to work is highly entertaining. But on the negative side, it is “no use” for actually knowing God or serving him. ¹Well, okay, Simon Burton has read it, and wrote a really fascinating book locating it in Baxter’s total intellectual project. If you’re looking for actual academic work, try reading his 2012 The Hallowing of Logic instead of punchy little blog posts like this one. Burton explains how even Baxter’s appropriation of a complicated Ramist-Lullist logic was in service to his catechetical theological project; further, he instructively puts Baxter in a family of late scholastic “Nominalized Scotism,” and then in a broader stream of trinitarian exemplarism that reaches back through Bonaventure. There is a great deal going on in Baxter! You could either get access to that “great deal” by sort of ignoring the triplicity scaffolding and eclectically taking what you find useful in his work (which is all I’ve done with him), or you could do serious retrieval and try to do justice to the genius of Baxter for his own sake.